Insiso provides bespoke software development services to a wide a variety of industries. Insiso’s understanding of technology, complete with an awareness of business process, allows them to define the best solution for any business requirement. With an obsessive focus on modern design, enhanced user experience and high-quality development, they are proud to claim that their technical expertise is second to none. Insiso prides themselves in their ability and dedication to create solutions to their clients’ business problems in the smartest and fastest way possible. Using the latest technologies, Insiso will work closely with you to translate your business specifications into a complete software solution. They are committed to ensuring that their innovations continuously exceed your requirements and expectations. In addition to their technical abilities, their unique development and delivery process gives customers full visibility, access and complete transparency of their working solution from inception to release. Insiso offers a fully managed mobile application development service to allow their clients to take their business prospects to the next level, by utilising modern mobile technology. Their development methodology involves the creation of hybrid mobile solutions with the ability to repackage and deploy the same native application to a variety of common mobile application stores such as iOS App Store and Google Play. The Insiso development team has a profound understanding, concerning all aspects of Microsoft’s most widely adopted web application framework, SharePoint. They cover everything from deployment to configuration and customisation. 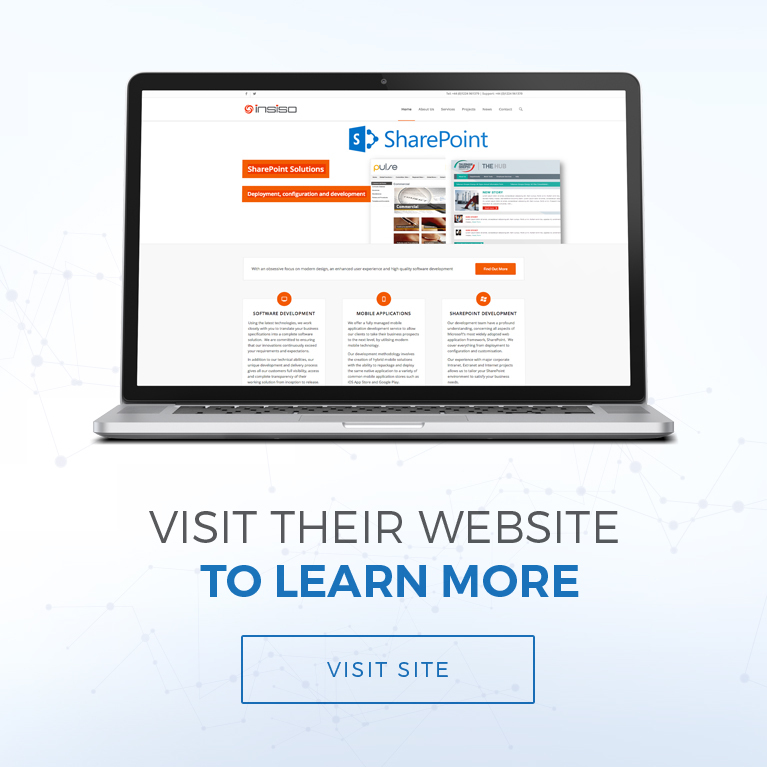 Their experience with major corporate Intranet, Extranet and Internet projects allows them to tailor your SharePoint environment to satisfy your business needs.